In the paranormal world, is it possible to bring some fresh fodder for consumption to the reading table? Believe it or not, yes and it’s coming from a new chef on the block, Kia Carrington-Russell. 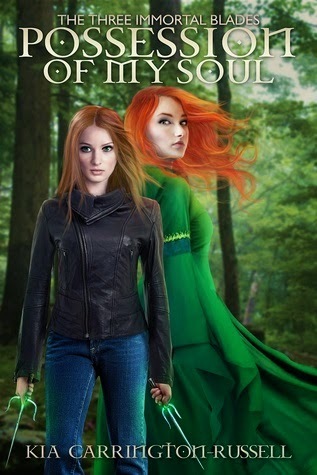 Possession of My Soul has many of the trappings of the paranormal world, a teen who never really fit in, filled with all of the normal teen insecurities , who is rudely awakened to the fact that she is different, special and she has a purpose that goes far beyond bringing home a 4.0 average. Here’s where we take out first turn off the beaten path, and what an adventure this is! Karla learns she has the blood of a demon flowing through her veins, not because of ancestral lines, but through a transfusion given to her mother while she was pregnant. Finally, there is a reason for her headaches, not that it’s a pleasant one. Within her lives a demon, trapped and fighting to come out. All around her new world are beings capable of killing, battling each other with magical weapons, each being looks human, but their powers vary. Oh and there are good guys and bad guys, depending on whose “team” you are on, I suppose. Caught up in a very loose triangle, Karla finds herself drawn to a boy from her human world and one from her new world. One of them is not who she thinks. One of them will betray her. When the time for battle arrives, who will stand with Karla, who will stand against her? A monstrous evil is rising to power and no one is safe, but Karla is on a mission and will not be deterred. I think Kia Carrington-Russell has hit one out of the ball park! Her characters are uniquely individual, some with agendas, some not, and part of the fun of this tale is trying to figure out who is who. Ms. Carrington –Russell has put a whole new slant on demons, good vs evil and the inner turmoil faced by her heroine, a determined young woman who is dealing with her new life, the best she can. Fast-paced, with action scenes that come alive, pain that feels real and those few moments of banter that lightens the tone. From the dialogue to the plot and each scene in between, I was hooked. I received this copy from Kia Carrington-Russell in exchange for my honest review.